It’s such a simple little song, a two-minute ditty about a woman sitting in a diner. Eight simple notes played in several variations, with a catchy a capella “doo doo doo doo doo doo doo doo” repeated throughout. But Suzanne Vega’s song “Tom’s Diner” is more than meets the ear. In fact, it is one of the most interesting and influential songs of the modern era. The lyrics of “Tom’s Diner” are a simple description of Suzanne Vega sitting in a coffee shop watching things go on around her. It’s an observational song, one that deals in details. In that regard, it’s very similar to the Ice Cube song “It Was a Good Day“, in which Ice Cube details all the things that happened on a single day, which a blogger named Donovan Strain dated to January 20, 1992. Because of the details in the song, “Tom’s Diner” is equally easy to date. In the song, she mentions a newspaper running “a story of an actor / who had died while he was drinking”. Vega admitted that the actor in question was William Holden, which dates the song to November 18, 1981. “Tom’s Diner” is not only based on a real date; it’s based on a real place. In the Morningside Heights neighborhood in Upper Manhattan, there’s a little café called Tom’s Restaurant. It’s been a popular place for decades, frequented by both Barack Obama and John McCain. It’s also the diner of choice for scientists studying global warming and climate change, since the Goddard Institute for Space Studies is just upstairs. But to most people, Tom’s Restaurant is the favorite haunt of Jerry Seinfeld and friends. The building’s façade was used on “Seinfeld” whenever Jerry, George, Kramer and Elaine went to eat at Monk’s Café. 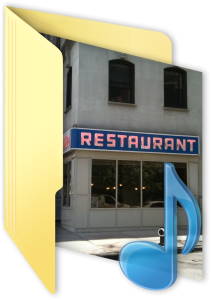 How a single diner could feature so prominently in song and on screen is beyond me. But Suzanne Vega’s song has one more claim to fame, one that impacts our lives on a daily basis. Today we take such things for granted, but if you want to listen to “Tom’s Diner”, you can do so with just a few clicks of your mouse (or taps of your finger). You don’t have to drive down to a record store and buy a physical CD. This is thanks to the invention of the MP3 file. Before the MP3, sound files were very large, too big to transmit over the Internet. That all changed thanks to a German engineer named Karlheinz Brandenburg. Brandenburg and his colleagues were working on ways to compress audio files to more manageable sizes, but the results were iffy. Then one day, Brandenburg heard “Tom’s Diner”. With its sparse and subtle vocals, the song was the perfect test piece for the MP3. Thanks to this song, Karlheinz Brandenburg and his colleagues were able to get the compression algorithms just right, and the modern age of digital music was born. Can you think of a song as influential as “Tom’s Diner”? Let me know in the comment section. It’s a pretty nifty fact, isn’t it? Wow! That is a fascinating article. I would figure that the first jpg was a naked woman (either that, or a cat). I love learning new things from my readers. Thanks for sharing.